The CoffeeShop Blog: CoffeeShop "Warm Cider" Photoshop/PSE Action! CoffeeShop "Warm Cider" Photoshop/PSE Action! Yesterday I was browsing at Pixabay for photos I can use in my tutorials here when I came upon this gorgeous image. I clicked on the photographer's name to see what else she had uploaded and I was in awe. So much in awe I wrote her a little message to let her know I loved her work and wanted to thank her for allowing people to use her images for free. Jill wrote me back and told me that she was Jill Wellington and had been following and commenting on my blog for years!!! I immediately recognized her name and went to her website and blog (visit her sites for the beautiful images, great tutorials, and freebies!) and was even more amazed. Her photography is up there with the best I have ever seen. And best of all, she is going to let me use some of her images on my tutorials here. Swoon!!! I need pretty photos of girls and women and her website is a goldmine of gorgeous images. I feel like it is an early Christmas for me. Jill also told me that she found Pixabay through my blog and decided to give back by donating some of her work. I adore her!!! 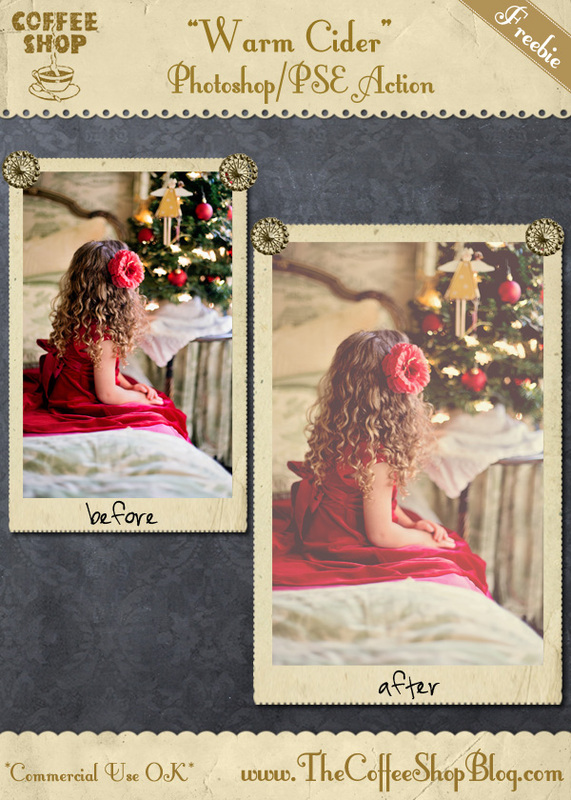 I so loved this lovely image of the little girl in red I had to write an action for it. I call it "Warm Cider" and it adds a warm golden effect with an adjustable haze and matte effect. It is perfect to warm up those winter images. 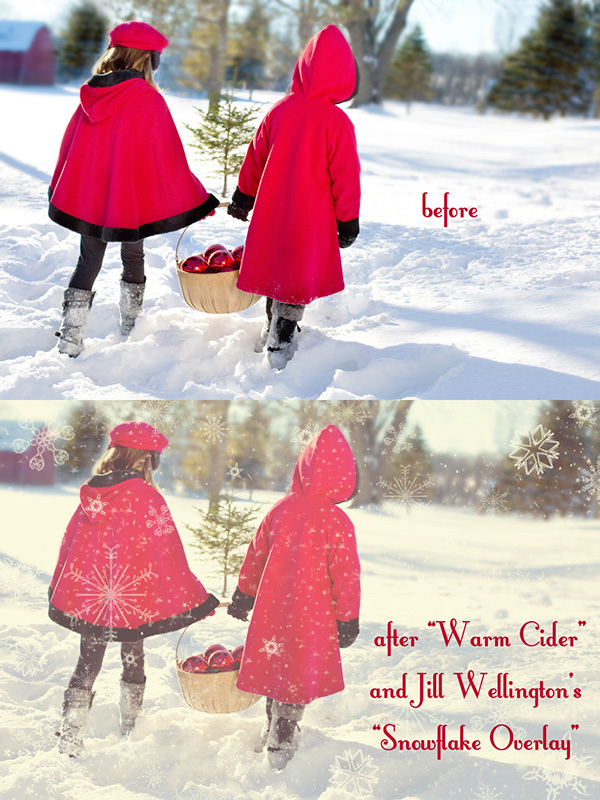 On this beautiful image from Jill I ran "Warm Cider" and added one of her snowflake overlays. This would be so pretty on a Christmas card. Please go visit Jill's blog, she has so many photographer freebies and tutorials posted there to read and download. I love her work!!! Download the CoffeeShop "Warm Cider" Photoshop/PSE action! You can also download it here. Oh, MY!!! Thanks so much for all your kinds words, Rita! I am in awe of meeting you after all my years visiting your blog every morning to learn something new and pick up FAB FREEBIES! It is great to "MEET" you even though I already know you from following you and your dear family here. I've even come to smile at the rats...♥ You did a wonderful job with these actions, as always! Can you edit for me all the time? Thanks so much for all you do, Rita! You are the best Jill!!! One I definitely didn't have. Love the warm tones in this. It was through you I was introduced to Jill's work. She is an incredible photographer and I have learned several things in Photoshop through her video tutorials so thanks for that. BTW, the link to her free snowflake overlays is no longer valid but understandable given this post is over two years old. Thankfully, I've picked a few of hers up over at Pixabay and have used them often. Actually, I think you introduced me to Pixabay too and that is a real blessing! It is a resource I use often. So, thanks for all you do to help us designers out Rita! Thank you so much Lisa! And I removed the snowflake overlay link. I can't find it on her blog anymore. :-) Her pixabay account is amazing!!! She is so talented and generous. I don't think they are posted on her blog anymore unfortunately. love your actions, thanks from brasil!